Let it Rise, Let it Rise.. Fat that is. Today’s tip involves how to remove extra fat from can good. The trick is to place canned good such as soups, in the frig and let them chill for a while. Because of science,(destinties and polarity), the coldness, will cause the fat to rise to the top of the can, allowing you to “scoop” it off, when you get ready to open it. Ever places oil and in pan of water.. It floats on top right, same principles applies here. 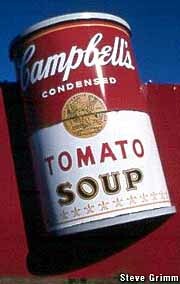 So Chill those can soups. This entry was posted on February 4, 2007 at 5:01 pm and is filed under Advice, Nutrition, Tip of the Day, Weight Loss. You can subscribe via RSS 2.0 feed to this post's comments. You can comment below, or link to this permanent URL from your own site. blog as well as I am bookmarking it for future reference.